If I could get my hands on a time machine, I'd be one happy lady. What eras would I like to visit in my tripped out DeLorean DCM-12 with 1.21 gigawatts of power -- courtesy of will.i.am, no less? Well, at least after he's had it registered. I've dreamed of visiting Edwardian England and sipping tea at Highclere Castle and going back to 1920s Chicago where I could be a flapper drinking bootlegged booze and watching silent films. But the one era I wish to visit most -- the 1940s. What is it about the 40s and World War II that garners my attention? I'm a big WWII buff. My interest ranges from the clothes to the movies to the home front to the Holocaust. I've read a lot of fiction focusing on the Holocaust and the war. So, when a new book comes out with a different angle on WWII, I try to get my hands on a copy. 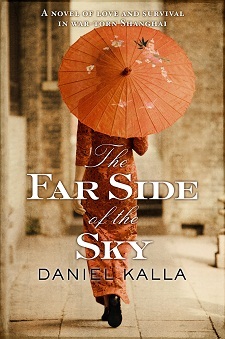 One such book is The Far Side of the Sky by Daniel Kalla. Here's the thing you need to know about Kalla, first -- he's the department head of two major teaching hospitals in Vancouver. Is it hard juggling two demanding careers, Daniel? "Not really. I believe in that adage: if you want something done, give it to a busy person. If I have six deadlines to meet, I might get four or five of them done in time. But God help me, if I only have one thing that needs to be accomplished. My natural laziness shines when I have too much time on my hands!" he said. "At the end of the interview, the Jewish journalist casually mentioned that her parents had both grown up in Shanghai. From the look of my face alone, she knew that I was in the dark on the subject. 'Have you never heard of the Shanghai Jews?'" Kalla's own parents' families had both barely escaped the Holocaust but he'd never heard of the more than 20,000 German Jews who fled to Shanghai during the late 1930s. He continues: "The more I read and researched their plight, the more committed I grew to capturing some of this vital history in a novel." "It wasn't until months after I wrote the novel that I realized -- actually my cousin pointed it out to me -- that my hero, Franz, was inspired by my father, Frank, who survived the war in Budapest as a Jewish teenager and later went to become a surgeon. My father died in 2010, but he shared so many of my hero's traits. Franz is stubborn as a mule but also stoic, principled and fiercely loyal to family and friends." He goes on to say: "Sunny emerges as arguably the strongest character in the novel. Sunny is a native to Shanghai, but having a Chinese father and American mother, she has faced lifelong discrimination by both the Western and Eastern cultures that dominated the city." I loved how both characters stories intertwined around their feelings of being outcasts, and discriminated against, as well as Sunny's feelings for being a woman in a man's world. As Kalla says, she feels an immediate "kinship" with the lost German refugees. Franz and Sunny also share close ties to their families, which complicates matters. Kalla says: "[Sunny's] romance with Franz is challenged at every turn, yet somehow their love does prevail." Franz and Sunny meet when he is forced to leave Austria to find safety in China. Prior to Franz's journey, he comes face to face with Adolph Eichmann. For his research, Kalla read countless memoirs and books on the Second World War in Shanghai. But he says the idea truly sprang to life when he visited the area with his wife. He explains: "To be able to see, smell and experience the setting -- much of which architecturally still exists, despite the concrete jungle of high rises springing up all around it -- was more than inspirational." especially stories with medical influences? 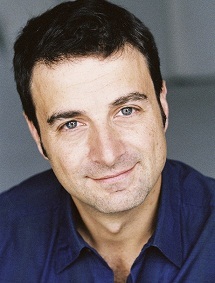 "I love the opportunity to simultaneously educate and entertain through my medical fiction. I still get a thrill when people tell me they learned something from one of my thrillers like how inappropriate use of antibiotics is contributing to the sky-rocketing rate of resistant infections or how hand-washing is the best way to prevent the spread of flu," he said. In his spare time, he enjoys reading historical novels and thrillers, spending time with his two daughters and is addicted to hockey, tennis and skiing, and serial television shows, like Mad Men and Boardwalk Empire. As for what he would like readers to take away with them after reading The Far Side of the Sky is this: "I hope they will be entertained by a suspenseful war story with elements of thriller, medical drama and historical romance. But also I would like to open their eyes to an amazing and little known piece of twentieth century history when divergent cultures collided in one cosmopolitan city and two repressed peoples (the German Jews and native Chinese) lived side-by-side with dignity and tolerance in an age of neither." The Far Side of the Sky was released on June 5th. Pick up a copy and enjoy!